Following the death of Spanish musical legend Paco de Lucía in 2014, his famous guitar of his own design, “La Maestro,” goes on a journey across nine countries. La Guitarra Vuela follows as this instrument, as revered as the master who wielded it, travels through nine countries on two continents, from one famous Latin guitarist to the next, taking you on a tour of the world of Flamenco and beyond from Spain to New York to Brazil to Cuba to Mexico to Argentina. Featuring musicians Tomatito, Caetano Veloso, Carlinhos Brown, Mariza, Alejandro Sanz and Luis Salinas, this is an inspiring Latin musical odyssey. The film was screened on the 24th of October at Hot Docs, Toronto. Musician Kevin Laliberté performed on his acoustic guitar and participated in a post-screening discussion with Mervon Mehta, executive director of The Royal Conservatory of Music’s Performing Arts Division. La Guitarra Vuela: 9 countries, 2 continents, 21,383 miles. 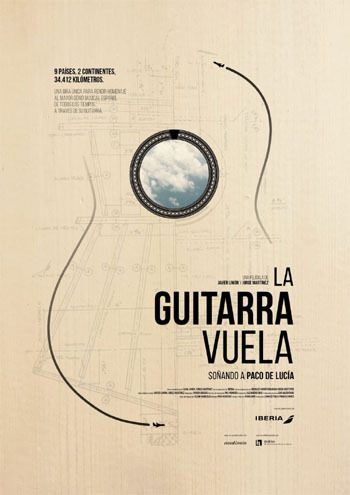 ‘La guitarra vuela. Soñando a Paco de Lucía’ is the story of a trip between Spain and Latin America, a tour with a unique musical instrument in the starring role, the peak in the life and work of a key artist in the history of music. La Maestro: The final guitar of Paco de Lucía has been off on holiday courtesy of Iberia to play a tribute tour. One guitar, major artists, brand new concerts, a documentary, a scholarship for two guitarists to keep training at the world’s most important and prestigious music college, Berklee College of Music, an album and a plane; these are the main ingredients of this wonderful project that pays homage to the musician, the instrument and the universality of an art that both embodied. Story: This is the story of a trip between Spain and Latin America with a unique protagonist: the last guitar designed by the genius from Algeciras, which he never had the chance to unveil to the world. From Mallorca, Jerez de la Frontera and Lisbon to the United States and Latin America, this musical instrument has been travelling, keeping alive the magic of its master, Paco de Lucía. ‘The Guitar Flies’ is the tribute that the music producer Javier Limón, the creative producer Jorge Martínez and Iberia make to a universal genius. La Maestro flew from hand to hand; from those of Carlinhos Brown to those of Alejandro Sanz, stopping off at Tomatito’s or those of Los Muñequitos de Matanzas, delivering anecdotes, nostalgia and a lot of art along the way.